With musicals enjoying their greatest popularity in years, it seems like an obvious time for A Star Is Born to return to theaters. But the new film, opening on October 5, isn’t a recent development; it has been in the works for years. Once planned by director Clint Eastwood with Beyoncé set to star, the production was stalled by the singer’s first pregnancy. Now it has a very different but no less compelling cast and crew. Bradley Cooper took over as director – it’s his first feature – and star of the romantic drama. 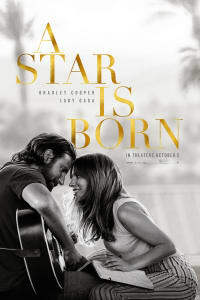 His version follows the talented but troubled musician Jackson Maine, who encounters Lady Gaga’s Ally, a struggling young performer. Ally and Jackson fall in love, and Jackson helps Ally find success. But problems soon arise, and their relationship begins to suffer. It’s no secret that A Star Is Born is a remake; in fact, it’s the fourth film version of the story. Let’s take a look back at the three prior incarnations of A Star Is Born. A Star Is Born first hit the big screen back in 1937, with Janet Gaynor and Fredric March in the leading roles. While much of the story carries forward to the 2018 version, there are some significant differences. Instead of a hopeful singer, Gaynor plays a struggling actress named Esther Blodgett, who dreams of making it big. Just as she’s about to throw in the towel she encounters Norman Maine (March), a fading actor whom she admires greatly. In the end, Maine gives her the boost she needs, ultimately helping her launch her career as Vicki Lester. The feature, directed by William A. Wellman, was met with critical acclaim upon its release and is still celebrated as a great film. With a crackling script that includes contributions from Dorothy Parker, the first A Star Is Born is a grand but resonant journey through Esther and Norman’s lives, with an incredibly moving ending. The early Technicolor cinematography – which is best experienced via an actual film print if you’re lucky enough to come across a screening – stunningly captures all the high and low points of the story. The first remake of A Star Is Born arrived in 1954, at the height of Hollywood’s love affair with musicals. The script borrows much from its predecessor, but does alter the premise slightly. The major change is that Esther is now a hopeful singer, the better to take advantage of the talents of star Judy Garland. While MGM was the undisputed home of top-tier musicals, Garland had left the studio, and this Warner Bros. release was set as her comeback. Garland’s Esther Blodgett is a young singer in a band, and she wants nothing more than stardom. When she crosses paths with an intoxicated Norman Maine (played by James Mason), she saves him from embarrassment during a press event. A thankful Maine begins to shepherd her career, but Esther soon makes it big on her own merits. From the beginning, the production was troubled by constant rewrites and problems casting Norman Maine. Director George Cukor wanted Cary Grant, but Grant was wary of Garland’s reputation, and rightfully so. Ultimately, film’s overwhelming problems were Garland’s addictions and instability. Cukor didn’t even shoot the final sequence, as he’d already left the production for a post-shoot vacation. In the end his preferred cut, which played at the premiere, was trimmed by almost half an hour, much to his dismay. And yet the final film is still a beautiful and grandiose romance punctuated by utter heartbreak. It’s one of the Hollywood greats. The next version of A Star Is Born arrived in December of 1976. Barbra Streisand and Kris Kristofferson starred, and this second remake distinguishes itself with a significantly different premise that reflects the then-current world of the 1970s. Kristofferson is John Norman Howard, a rock star at the peak of his career, struggling with alcohol and cocaine addiction. At a bar after a disastrous performance of his own, Howard sees a performance from a group fronted by Esther Hoffman. Their personal and professional courtship takes a while, but after singing on stage with Howard, Hoffman’s career blossoms just as quickly as Howard’s goes into decline. A Star is Born hits theaters on October 5, 2018. 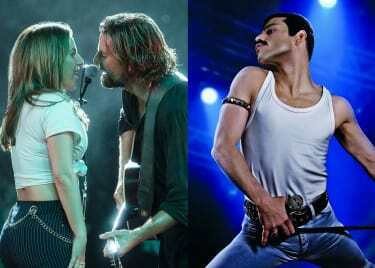 Bradley CooperLady GagaDramaMovies about MusicRomantic DramaWarner Bros.